Nearing the end of winter, Birds in Spring may be wishful thinking on my part. This charming design of birds, presumably martins, flying around a bird house is rendered in a minimal fashion. Printed on a silvered background, the design is rendered in three colors which are used to good effect. The green, red, and white coloring of the birds imparts an abstract, flat appearance while the use of the ground color to create their feathered bodies heightens this effect and helps them blend into the background. This example contains most, if not all, of the pattern, and this scene of the bird house and birds would just keep repeating. It would be hung in a drop match fashion to avoid creating bands of birdhouses across the wall. While I like the design, I was unsure what room this would be appropriate for. I found my answer in the Chicago Daily Tribune where the author referred to it as a breakfast room paper. 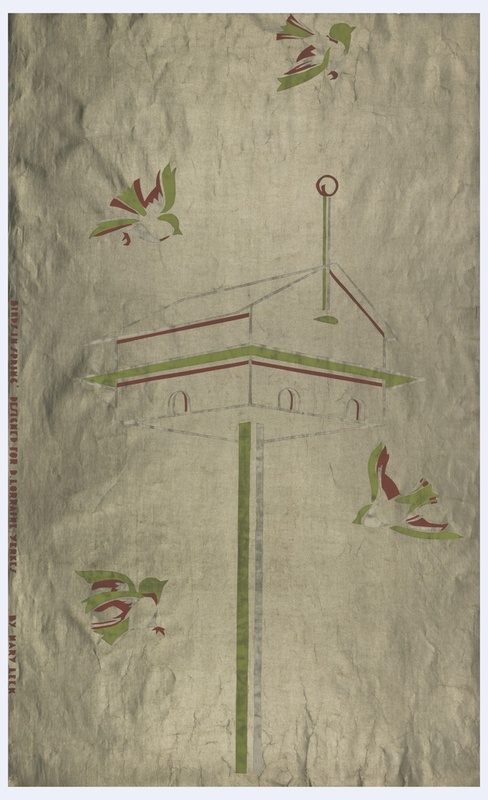 It turns out, this paper was included in a wallpaper exhibition at The Art Institute of Chicago in 1941, said to be the first exhibition of wallpaper in an art museum. She went on to say that papers for this room “are designed to correct the mistake of getting out of the wrong side of the bed in the morning. Bright and mood lifting, they bring spring and harmony inside in any weather.” Which makes sense; if you’re sitting in your breakfast room looking out into your yard, the paper could help bring the outdoors in. The slivered ground might also reflect the sunlight and pick up the green of the lawn. It is impressive that a group of contemporary wallpapers were displayed in such a prestigious institution. The papers were created by a variety of designers for D. Lorraine Yerkes, a Chicago-based decorator and designer. A number of these wallpapers had previously been donated to Cooper Union, now Cooper Hewitt, Smithsonian Design Museum. Greg Herringshaw is the Assistant Curator in Wallcoverings.